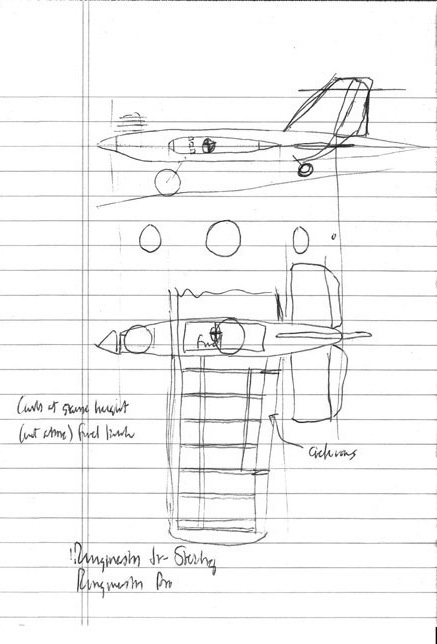 I found a couple of old preliminary design sketches some months back when I was looking for something else in the computer room. I’d forgotten about this note pad. Some years ago, I was jazzed about the notion of getting back into engine-powered model airplanes (U-Control). I drew some sketches. 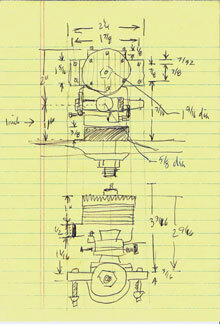 I’m not very good at freehand mechanical drawing, but it seems this is almost a lost art form. 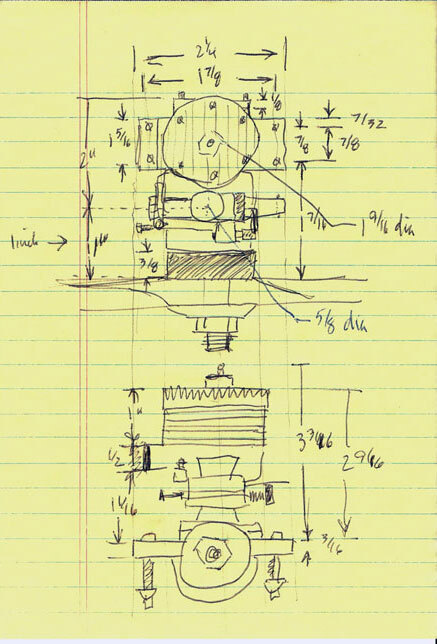 I can’t resist looking at almost any mechanical drawing to see how it works. So I scanned these. Click the images for full-size views. The engine here is a Fox .45 with variable throttle (actually for radio control). It sits out in the garage gathering dust, as it has for 30 years. 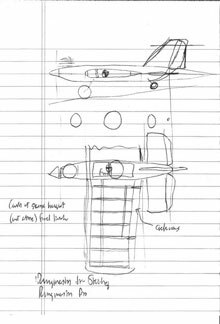 The reason for the sketch was to design engine mounts and housing of the right size to mount the engine inside a built-up 3-D fuselage – instead of mounting externally on a solid balsa and plywood slab fuselage. The chances of this project actually being completed is slim but I have to admit it still sounds like fun. The model sketch shows the horizontal stabilizers ridiculously close to the trailing edge of the wings. This is not the loss of perspective and judgment it seems: in stunt and “combat” models, this foreshortened design gives incredible climb and dive response – and a hair trigger sensitivity. Since we published C.Bear’s story “The Elusive Mr. S”, we’ve already received a request from a fan who wanted to know, “Where can I get one of those Squirrel Detectors?” Actually, it’s so simple that we make our own. Now, you can do the same. Just follow these simple instructions. Before you know it, you’ll be in the squirrel detection business as well. Locate a cedar shingle in good condition, not too weathered. First, split it along the grain so you have a piece approximately 3 inches wide. Now trim it to a more compact length, say, about 5 inches long. Plan your cut so that the 5″ section includes the feathered thin edge of the shingle. The feathering enhances detection of birds, while not impairing squirrel detection in the slightest. Exact dimensions are not critical in any part of the construction. The detection parts consist of a (1) power source, (2) receiving and (3) transmitting antenna, and (4) the actual detector. 1) Any old battery will do, as this is a very low-power device. Flat batteries are easier to glue to the shingle. 2) You can wind your own receiving coil with a stiff copper or baling wire. Wrap several turns around a form (a magic marker is about the right diameter). Carefully bend the last 1/4 inch upright to impress your friends. 3) Fashion your dipole (transmitting) wire from matching wire stock. 4) Locate a good 5/16″ or 3/8″ nut. We favor sprocket nuts from old Schwinn bicycles, but anything of about the right size will do. Metric is excellent, and will enhance old-world bird detection as a bonus. Chrome-plated nuts are hard to find, but they do show off your detector to the best advantage. Now, glue the parts into place. Referring to Figure 1, along a left to right center line, glue your receiving antenna, transmitting antenna, battery, and detection nut. Allow to dry overnight. No wiring or soldering is required. The parts are already interactive. Although no particular voltage is required, locating a battery holder allows you to more easily replace your battery with a fresh one, if desired. Finishing touches: Perfectionists may want to spray varnish the assembly with several coats of marine spar varnish. Cedar is excessively absorbent, so be warned you will need several coats for a uniform gloss. On the other hand, natural cedar ages gracefully to a fine grayish patina, so we side with purists who deem the detector “finished” once the parts are glued into place and dried. Now comes the best part. You are ready to test your genuine, original new Squirrel Detector (though truthfully there is so little that can go wrong). Take your detector to a park, garden, back yard or wooded area that squirrels are known to frequent. You can place your detector on your car dashboard, or aim it in your hands in a sweeping motion around the grounds. Either method works equally well. When you see a squirrel, go “Beep! Beep” to train your detector. Thereafter, when you see a squirrel, go “Beep! Beep!” to keep your detector in prime condition. Congratulations! Your detector is already trained and working! When your friends see your detector in operation, not only will you be the talk of the neighborhood, you alone will hold the secret of how to construct a genuine Squirrel Detector! 1. Results may vary. Do not be discouraged if you don’t start detecting squirrels right away. Try a different park. Since you are responsible for fashioning your own detector, we can offer no warranty, expressed or implied. 2. Not intended for use in the Mojave, Gobi or the various continental ice shelves. 3. Your Squirrel Detector already has the built-in Language plug-in. On hearing the special cue words “Beep! Beep”, “Quack-Quack!” or “Honk! Honk”, savvy bystanders in any country will have no trouble understanding what’s going on here. 4. Never point your device at large, menacing wild animals. Talking Crow Productions is proud to present a little cgi program that allows you to roll your own roll of Osama Bin Laden toilet paper. A single sheet is displayed below. Licensed from our programming branch Very Mature Productions, Inc. (less-known producers of the text-to-speech file 3,379 Bottles of Beer On The Wall, an unpublished 609,861KB WAV file). 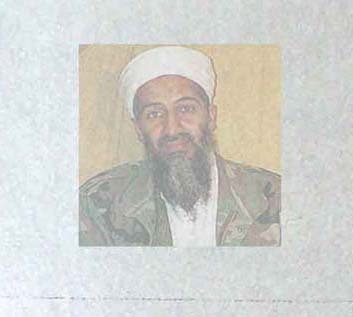 Click this Bin Laden TP link to operate the program.